Any journey in space is heavily influenced by the propellant available to achieve it. At the same time, the amount of propellant required is largely determined by the mass of the object that is to make the journey and how quickly the journey has to be undertaken. 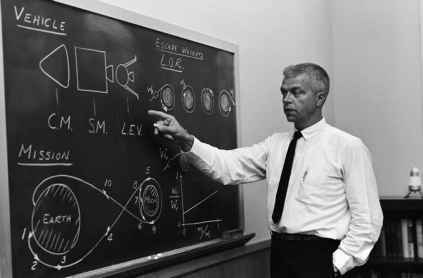 The alternative scheme, known as lunar orbit rendezvous (LOR) sought to limit the amount of mass that had to be propelled at any stage of the journey. A reduction in the quantity of propellant required for the Apollo spacecraft would also minimise the initial mass that would begin the journey and bring the entire mission within the capability of a single Saturn V.
John Houbolt of Langley, the champion of lunar orbit rendezvous. again, a dedicated lander would be designed specifically for the task, leaving the Apollo mothership, the CSM, with the consumables and the propellant to get home, in lunar orbit. This lander would only have to take two of the crew down to the surface, leaving the third to take care of the CSM. Moreover, there was no need for the engine, or the landing gear, or the empty tanks that had taken them down to the surface, to come back up to lunar orbit. The crew could return to the mothership in only the top part of the lander, using a smaller engine and propellant load for the task. As there would be no need to bring the remaining part of the lander back to Earth, it, too, could be discarded at the Moon. 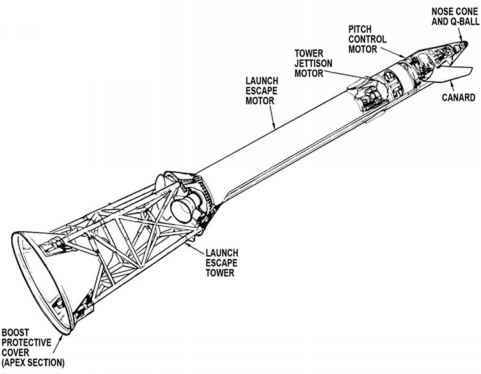 Therefore, the final propellant load for the CSM was made up by the fraction required to get the entire assemblage into lunar orbit, plus the fraction required to get itself to Earth. At every stage of the flight, only a minimum amount of mass would be accelerated, and everything else would be discarded when its function had been fulfilled. The cumulative weight savings made the LOR scheme highly attractive in engineering and cost terms, but it caused NASA to face certain operational realities which, in the early days of space flight, seemed daunting. As with EOR, having separate spacecraft meant learning how to rendezvous in orbit when both were travelling at what were then perceived to be incredible speeds. The ships would have to join together, or dock, to allow crewmen and cargo to transfer from one craft to the other. Neither of these techniques had yet been demonstrated in Earth orbit, yet the LOR concept was calling for them to occur nearly half a million kilometres away in the lonely vicinity of the Moon. A failure of the rendezvous would doom the occupants of the lander to certain death in lunar orbit, while a failure of the docking would require crewmen to don spacesuits and manoeuvre themselves from one craft to another by going outside. At a time when no one knew what challenges the weightless environment would present to a crewman in a bulky pressure suit, this seemed to be a very risky thing to do. Many in the burgeoning space community were aghast at the audacity of LOR. It seemed foolhardy and dangerous. However, convinced of the benefits, and with an almost religious zeal, its leading advocate, John Houbolt, drove through layers of NASA bureaucracy and the entrenched positions of its various centres, to try to convince the organisation that there was little chance of getting to the Moon, as they had been tasked, unless LOR was adopted. NASA debated the mode issue for more than a year after Kennedy had laid down the challenge of a landing within the decade, during which time, direct ascent and its incredible Nova launch vehicle was largely discarded, leaving EOR, championed by von Braun, and LOR, which had become Gilruth's preferred option, as the competing schemes. As work on the spacecraft could not begin in earnest until the matter was settled, Joseph Shea from NASA headquarters asked each side to report on the other's scheme - a management strategy that brought von Braun around to seeing the benefits of LOR. In June 1962, at a large meeting at Marshall, NASA acceded to Houbolt's campaigning and chose LOR as the way they would get to the Moon. American Aviation. These craft were already well into their initial development, but their role could now be precisely defined; there being no need for a landing stage on the SM, for example. Major components for the SM had already been designed. It was decided to leave the thrust of its propulsion system at its original design value and take this into account in mission planning. Two versions of the CSM would be built. Block I would be incapable of supporting a mission to the Moon, but would allow procedures to be practised and experience to be gained in Earth orbit until Block II spacecraft became operational. The Block II would be the Moonship proper. Complete with fuel cells for power, hardware for docking, deep-space communications and a fully capable guidance and navigation system, the Block II CSM would be the linchpin in the Apollo story, delivering a spidery landing craft to another world. In a sense, the CSM was a mini-planet, providing everything three men would need for two weeks in space while taking them on a journey that had been a dream of humans over the ages. In the event, the design of the Block II would be forged in the lessons learned from the fatal flaws that would prevent the Block I from flying a manned mission.